Ganirelix Acetate is an injectable gonadotropin releasing hormone with specific antagonistic (blocking) activity. It is indicated for the inhibition of premature LH (leuteinizing hormone) surges in women undergoing controlled ovarian hyperstimulation. 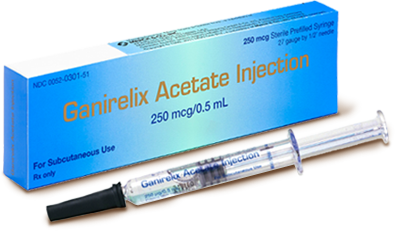 Ganirelix Acetate is available as a prefilled syringe containing 250mcg/0.5ml. Ganirelix Acetate is an injectable medication administered subcutaneously. Ganirelix is typically administered once daily. It is initiated a few days after FSH (follicle stimulating hormone) therapy and should be continued until the day of HCG administration. Ganirelix Acetate works immediately by suppressing LH and FSH secretion. This allows for eggs to reach the level of development needed for fertilization. Side effects may occur including: abdominal pain, headache, vaginal bleeding, nausea, and injection site reaction. If you experience an allergic reaction: difficulty breathing; closing of the throat; swelling of the lips, tongue or face; or hives; seek emergency medical attention immediately. 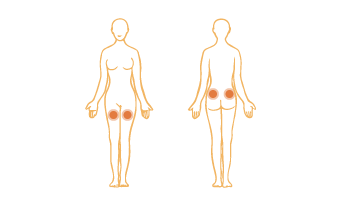 If any time you experience: pain, warmth, redness, numbness, or tingling in an arm or leg; confusion, severe dizziness or severe headache, seek medical attention immediately. Ganirelix can be stored at room temperature.